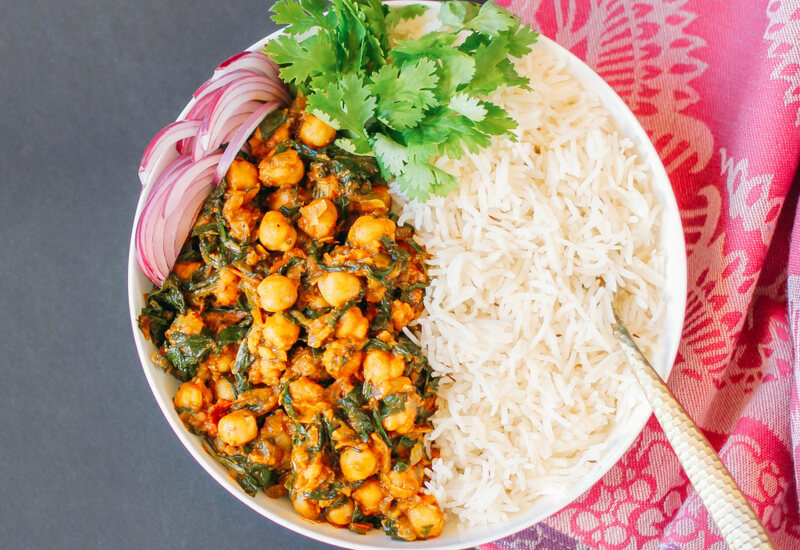 Chana Saag is a vegan dish from India featuring chickpeas and spinach. In India, the pressure cooker has long been used to deliver complex flavors in relatively short cooking times. Here onion, tomato, cumin, turmeric, and garam masala work well together for a delightful dish in less than half an hour. Ghee is used to when sauteeing the onions in the MultiPot. It is a form of clarified butter often used in Indian dishes. Ghee is useful in many recipes because of its high smoke point. Melt ghee in a pressure cooker set to Sauté. Stir onion into the ghee to coat, place a lid on the slow cooker, and cook onions until softened, about 2 minutes. Stir ginger, garlic, cumin powder, red chili powder, salt, and turmeric with the onion; cook until fragrant, about 30 seconds; add tomatoes and stir. Pour ⅓ water into the slow cooker, add chickpeas, tomato, and water and stir. . Select Pressure Cook (Manual) and cook for 4 minutes on High pressure. Stir garam masala and mango powder through the chickpea mixture; add spinach and stir to coat. Cook until spinach wilts, 2 to 3 minutes. This dish is traditionally served over rice or with naan (Indian-style flatbread). If you cannot find the amchoor, use 1 teaspoon lemon juice. If you opt to use dried chickpeas, soak for eight hours before cooking and increase time to 25 minutes. Per Serving: 196 calories; 7g fat; 27.7g carbohydrates; 9g protein; 11mg cholesterol; 1032mg sodium. This vegetarian chana saag recipe was perfect. I did not miss the meat in this dish because the sauce was perfectly flavor. I'm obsessed with Indian-food, so I'm slightly biased, but this recipe is a must try. I've never heard of chana saag before, but I will never forget it now! I really love Indian cuisine because the flavors are so rich. This recipe was really easy to make and had great flavor. I'm not just a curry chicken guy anymore, and am glad to add this to my kitchen repertoire. I did not hunt down the "amchoor" to make this, but went ahead without it. Will try to remember to get some next time I'm near the Indian grocery. I cannot imagine it will make it that much better, but I'm willing to try because it's delicious already! If anyone has a version using dried beans, please let me know. I just like the texture a little better. I wish I could have cooked the chickpeas in the pressure cooker without soaking overnight. Other than that, this recipe is quick and easy. Wasn't able to find amchoor to make this recipe, but lemon juice worked OK as a replacement. I also used dried chickpeas so it took a little longer. Made this tonight but used cayenne pepper as I did t have red chili powder. I almost used smoked paprika but went with the cayenne which gave it a kick. Didn’t have the dried mango item either and didn’t see the melon juice tip. Oh well, it still turned out great, over jasmine rice. I’ll double it next time as I’d like to freeze some portions and want more liquid. Delicious and easy to prepare. I’ll double this recipe next time.